First day of having solid foods incorporated in the cleanse! If you are just starting to follow me during my cleansing adventure, or are feeling a little lost Day 4 of the cleanse starts Phase 2 where fermented foods loaded with prebiotic and probiotic foods are added. This gives the gut the healthy bacteria needed to have a properly functioning metabolism, digestion, elimination and prevents/aids IBS & Crohn’s symptoms. 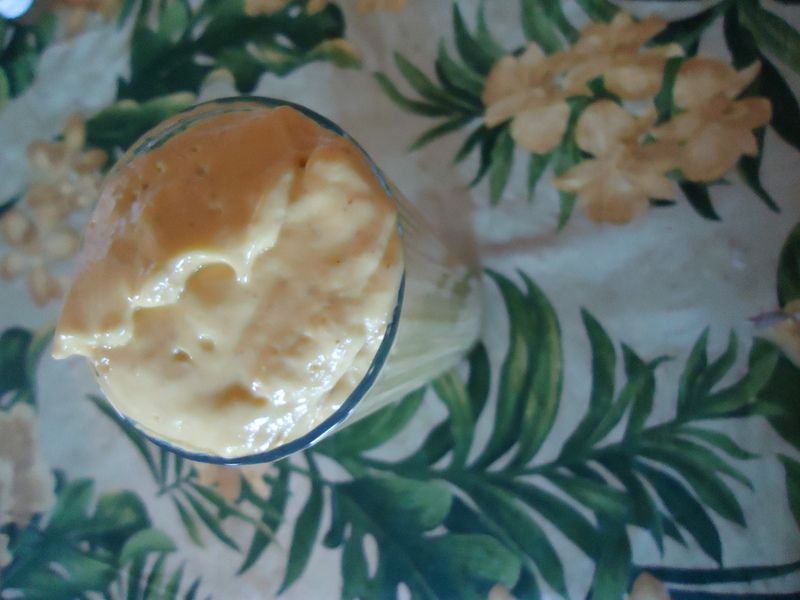 The Ginger Mango Shake was just like a mousse, thick, whipped, fill & satisfying texture and I even had fun scraping the blender and my cup for more. I think I have mentioned before that I’m a fruit junky, so starting off Phase 2 (Day 4 of Ani’s 15-Day Fat Blast) with some delicious mango was rewarding. 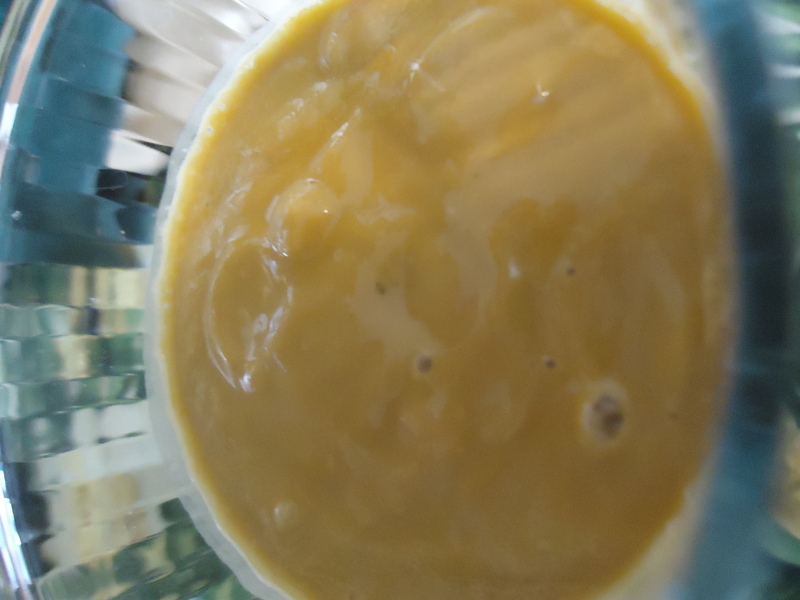 I did add the “Squeaky Cleaner” to this smoothie, and it helped give some flavor and warmth to the shake. Ginger is a wonderful anti-inflammatory and is also great for your digestion. Just a little bit of this root goes a long way in taste and health benefits. The Easy Being Green Salad for lunch was insanely filling. I took my time eating the salad. The fermented food made me so full so easily. This salad takes very little time to make but is loaded with beautiful colors and flavors. I usually do not eat capers, not a fan, but I tried it out because it was part of the recipe and I surprised myself. It went well with the other ingredients in the salad and added a salty & smoky flavor that was fantastic to have after three days of just liquids. This recipe is a keeper for Day 15 when I can pick & choose recipes! So many useless calories and fats are in dressings now and days, and sometimes the ingredients are sketchy. 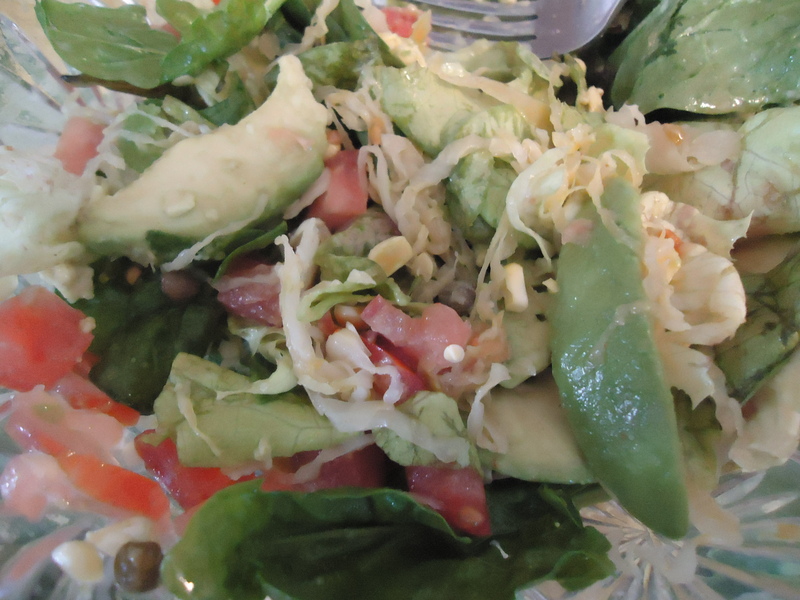 Using fruits, vegetables and/or fermented foods will make a much more guiltless dressing that actually tastes good too. Even an hour after eating the salad I was feeling stuffed to the point that I only took a jog instead of a run in the afternoon. About 50 minutes after eating this salad I had a healthy elimination. Today I was feeling very worried in the morning about some things I am trying to plan out. But as the day went on I more or less got over it with a little assurance from friends. I am hoping to add more fermented foods into my eating routine even after this cleanse. They seriously make salads bomb diggity. My water intake still isn’t as high as it should be Today I was supposed to drink kombucha, coconut kefir, or some sort of probiotic coconut drink. I picked up a Strawberry Coconut Kevita at the store, it was the only flavor they had. I’ve had it before but I prefer the Green one or something a little bit more plain…these types of things always taste too sweet. I only managed to drink close to half of it :X There isn’t anything anywhere in Ani’s book on what time to drink a fermented drink. But just to play it safe I will not finish the rest of it today (there is a rule that we can not eat after 7pm). Please come visit me here and seeing how the cleanse is going for me tomorrow! Thank you all for reading, much love ❤ and raw power. Category: Uncategorized	| Tags: Ani Phyo Cleanse, Ani Phyo Fat Blast Results, Ani Phyo's 15-Day Fat Blast, Ani Phyo's Fat Blast, capers, Day One Phase 2, Does Ani Phyo's Fat Blast Work?, Easy Being Green Salad, Fermented Coconut Drink, Fermented Drink, Fermented Food, Fermented Foods, First Day of Solids Ani Phyo's Fat Blast, Ginger Mango Shake, Kevita, Kevita Coconut Probiotic, Phase 2, phase 2 fermented foods, Prebiotic, Probiotic, Probiotic Coconut Drink, probotic, Strawberry Coconut Kevita, Strawberry Coconut Probiotic Drink, what are prebiotics?, what are probiotics?